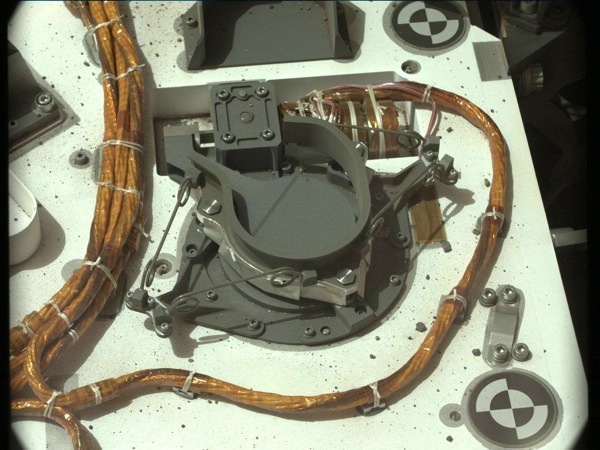 Knots adjusting the wiring on the deck of Curiosity rover (Credits: NASA). As noticed recently by some geeks around the International Guild of Knot Tyers Forum, not every space technology needs to be high tech. Some considerably ancient inventions play an irreplaceable role inside the most state-of-the art spacecraft. One example– Curiosity, the engineering marvel from NASA JPL –relies on clove hitches and reef knots to adjust the cables, harnesses and wiring. This fact, surprising to some, was revealed by the images of Curiosity’s deck, which the rover has sent to Earth together with images of the Martian surface. As discussed at the forum, there are many reasons why NASA sticks to this simple but efficient solution. First of all, you can hardly find a more thoroughly tested, proven, and reliable technology than a knot that has been used for several thousand years. Both of the most frequently used space knots – the Clove Hitch and the Reef Knot – have been known at least since the times of ancient Greece where they were described by the pioneering physician Heraklas as suitable for surgery and orthopedics. Very similar knots were reportedly depicted in the art of ancient Egyptians which dates 4000 to 5000 years back. The NASA knots manual (Credits: NASA). When compared to modern zipties, the knots and their combinations offer specific advantages. The zipties are prone to overtightening which can result in breakage of conductors, damage of insulation, chafing or deformations between the conductive, dielectric, and shielding parts of the cable. The rather modern zipties, unlike the ancient knots, offer only predefined levels of adjustment and cannot be easily loosened.